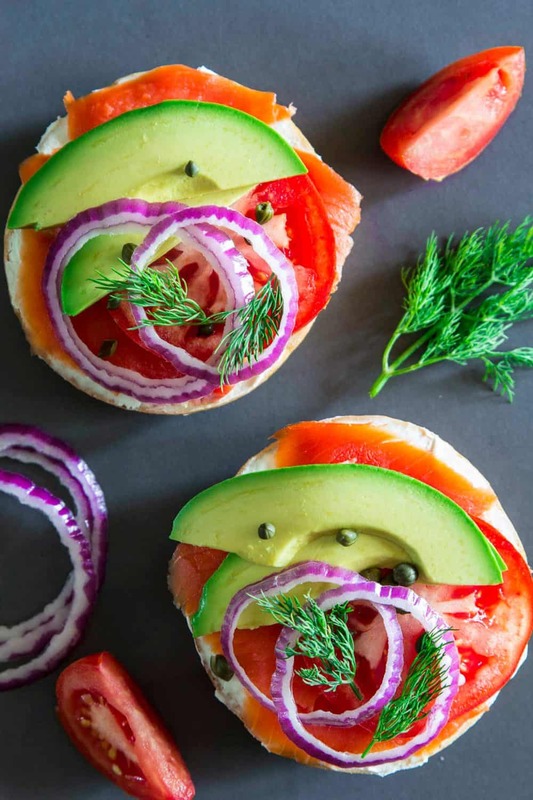 This smoked salmon bagel consists of wild Alaskan sockeye salmon spread onto warm toasted bagels with cream cheese, avocado, red onion, tomatoes, and fresh dill. This post may contain affiliate links. Read my disclosure policy here. This recipe was originally posted on Jan 12, 2017, we’ve tweaked it a bit since then. This smoked salmon bagel can be customized according to your liking. 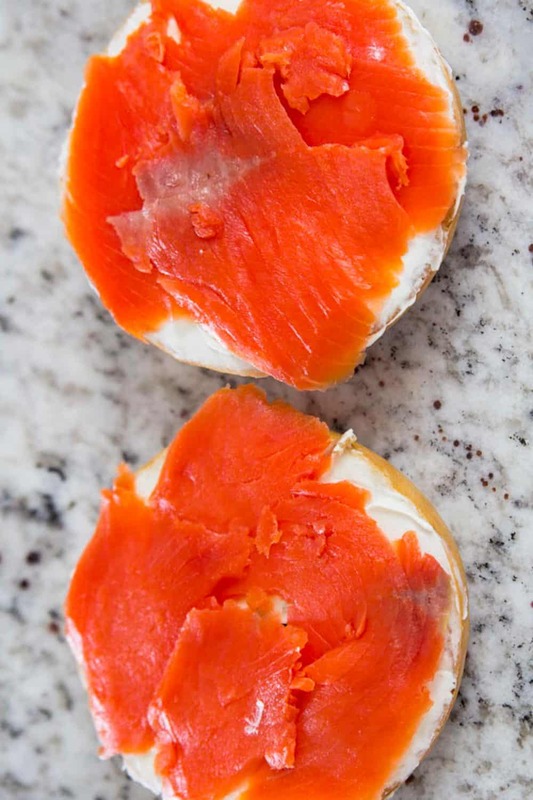 The important part of the recipe is the bagels, cream cheese, and cold smoked lox salmon. From there on you can add on as many toppings as you like. When hosting brunch, this smoked salmon bagel is always on the menu. They also make a great appetizer when cut into smaller pieces. You can make it as basic as these 3 ingredients. Toast the sliced plain bagels in a toaster until golden brown. Then spread your desired amount of cream cheese on top of each halved bagel. 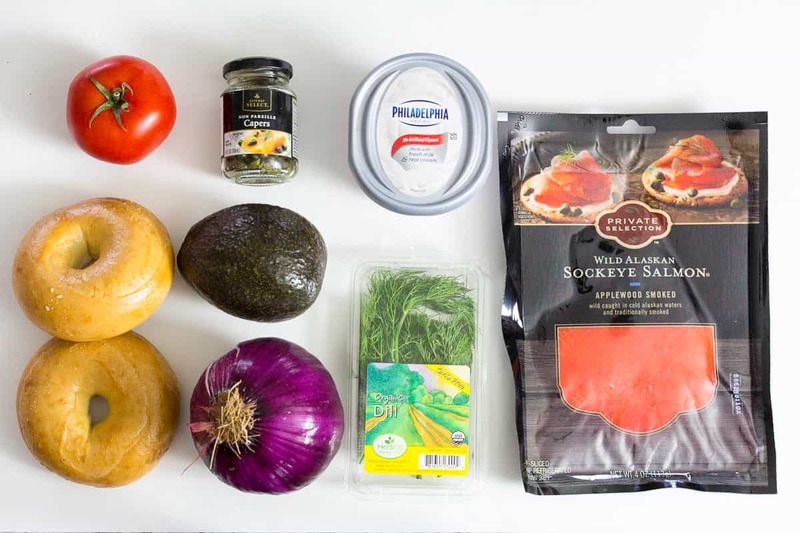 Now add the smoked salmon and the rest of your favorite salmon bagel toppings. The most common type of salmon that gets topped on salmon bagels, is cold smoked salmon. Also referred to as lox salmon. Cold smoked salmon, also known as lox, is cured in a salt and sugar rub. Hot smoked salmon is marinated in spices and sugar then smoked with heat along with wood chips. An easy and delicious smoked salmon bagel. This recipe is loaded with cream cheese and healthy toppings. Slice the bagels in half and toast them. Spread cream cheese on each bagel slice. Add a desired amount of smoked salmon and sliced tomatoes. Add sliced avocado, red onion, dill, and capers. Eat fresh.